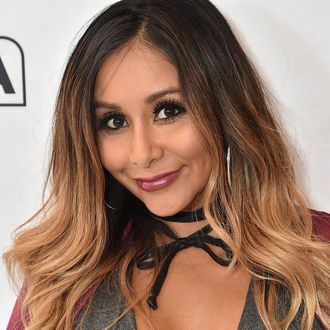 The washboard abs and Bumpit hair of Jersey Shore may be firmly lodged in our collective cultural memory, but Nicole “Snooki” Polizzi isn’t resting. After the cast reunited in June for MTV’s spinoff, Deadline reports she’s gearing up to host an upcoming show where people let their friends, family members, and significant others give them tattoos without their knowledge. It’s being called — wait for it — Just Tattoo of Us. Snooki will be hosting alongside Nico Tortorella, who’s not a tattoo artist but plays one on TV’s Younger. Like all prestige television, Just Tattoo of Us has seen success across the pond, and is now being localized for MTV’s U.S. audiences. The show “puts relationships through the ultimate experiment of trust,” per Deadline, by having people tattoo one another while they’re blindfolded, the design unbeknownst to them until it’s permanently inked. Professional tattoo artists and creatives will help design the ink, but judging by the U.K. version’s past episodes, it seems the show is more an opportunity for a (relatively) permanent prank.